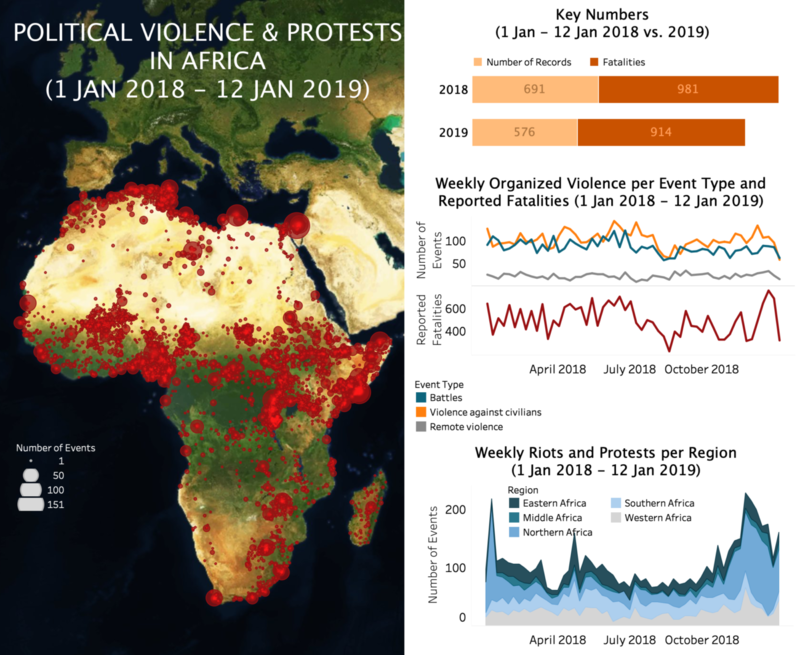 Key developments in the week of January 6th include the violence in the CAR, the flare-ups along the border between Libya, Chad and Sudan, and the rising frustration with, and within, a number of political systems in Africa, including in Gabon, DRC, Sudan and Senegal. In the Central African Republic (CAR), violence has been rising over the past two weeks amidst renewed international efforts to revive the African Union-led dialogue between the government and the various armed groups active in the country. The tensions span multiple fronts in CAR. Key among them is the enduring violence by Ex-Seleka and Anti-Balaka forces in the eastern part of the country. Ex-Seleka forces of the Union for Peace in the Central African Republic (UPC) and Popular Front for the Renaissance of Central Africa (FPRC) gained ground against Anti-Balaka and Central African forces in and around Bakouma (Mbomou) at the end of December. This sparked further clashes last week, with Anti-Balaka forces regaining parts of Bakouma on January 8th. Ex-Seleka fighters also launched large attacks on regular sites of violence last week. The FPRC abducted dozens of people in Bria (Haute-Kotto), including UN employees, on January 6th, whilst the UPC attacked Bambari (Ouaka) over January 10-11th. France deployed fighter jets from Chad to Bambari on the second day of the clashes, as a “show of force”. Other key centres of tension in CAR emerge around the presence of militants in Bangui’s KM5 neighborhood and of 3R militants under Siddiki Abbas in the northwestern prefectures of Ouham Pende and Nana-Mambere. Violence can quickly escalate in these areas, as illustrated last week with the killing of four people in KM5 right after a grenade targeted a truck of Fulani herders near Bangui. Violence also flared up again along the borders between Chad, Sudan and Libya last week, showing once more the high instability in this area hosting multiple armed groups. In the Tibesti region of Chad, rebels of the Military Command Council for the Salvation of the Republic (CCMSR) repelled an attack by Sudanese rebels from the Justice and Equality Movement (JEM) in the area of Kouri Bougoudi. The event suggested not only a new JEM presence in Chad but also potential links between the Sudanese rebels and the Chadian military to counter the CCMSR. Libyan Arab and Chadian non-Arab gold-mining communities clashed a week prior in the same area already, leaving around 40 people reported killed and 200 wounded. Meanwhile, on the Libya side, at least two incursions were reported in the town of Sebha last week, including one targeting the security directorate. In response to the rising activity along its borders with Chad and Sudan, the Libyan air force launched new airstrikes and deployed further forces on January 12th to counter Chadian and Sudanese armed groups. Other key developments in the week of January 6th highlight rising frustration with, and within, a number of political systems in Africa. In Gabon, a group of six soldiers led by Lieutenant Ondo Obiang Kelly, the deputy commander of the Republican Guard, attempt a coup in Libreville by taking over the state radio station. The military took back the station a few hours later, killing two and arresting several others involved. The incident revealed the rising doubts over President Ali Bongo Ondimba’s ability to continue to lead the country due to his prolonged hospitalization. Supporters of the Union Nationale opposition party held a series of protests at the end of November 2018 already to call for Jean Ping’s election as the head of state in view of Bongo’s absence. In the Democratic Republic of Congo (DRC), riots erupted in many parts of the country after the electoral commission declared opposition candidate Felix Tshisekedi the winner of the presidential election – a result rejected by the National Episcopal Conference of Congo (CENCO), which independently observed the polls. Police used tear gas and in many locations live ammunition to quell angry crowds, leaving at least four killed. In Sudan, anti-government protests continued for the fourth week in a row in a number of major towns and cities, and grew particularly in Omdurman and El Gedaref. The government continues to repress the protests, with over 800 people arrested so far and another three demonstrators killed on January 9th in Omdurman, bringing the total of fatalities in riots and protests to at least 27 since mid-December. Lastly, protests calling for fair and transparent elections rose last week in Senegal following the invalidation of 22 out of 27 candidates by the Constitutional Council, including two of President Macky Sall’s key rivals, Karim Wade and Khalifa Sall. The opposition denounced the move as a way to ease the President’s re-election in February, protesting nearly daily in Dakar between January 9-12th.